ww2dbasePrince Nobuhito was born at Aoyama Palace, Tokyo, Japan. He was the third son of Emperor Taisho and younger brother of Emperor Showa. 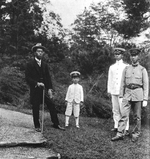 In 1913, when Prince Arisugawa Takehito died suddenly without a male heir, Prince Nobuhito was named the head of the Takamatsu branch of the imperial family. Between 1922 and 1925, he attended the Imperial Naval Academy. Upon completion of the academy, he was given a rank of sub-lieutenant and served aboard battleship Fuso. In 1926, he studied at the Torpedo School, in 1927 at the Naval Aviation School at Kasumigauara, and in 1930-1931 the Naval Gunnery School at Yokosuka. 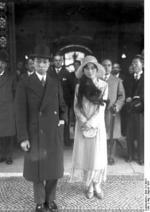 On 4 Feb 1930, he married Kikuko Tokugawa, the second daughter of Prince Yoshihisa Tokugawa; the couple did not have children. 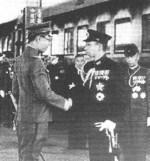 In 1930, he was promoted to the rank of lieutenant and was attached to the Naval General Staff in Tokyo. In 1931, he commanded a squadron from heavy cruiser Takao, then in 1933 returned to Fuso. In 1936, he studied at the Naval Staff College, and upon completion he was promoted to the rank of lieutenant commander. Upon hearing the developments of the Kwantung Army in Manchuria, he voiced warning for the Japanese Army's actions which would lead to war against China, but as a naval officer he had little influence over the army. In Sep 1940, he was promoted to the rank of commander. In 1941, after the Pearl Harbor attack, Prince Nobuhito expressed his concern for Japan's declaration of war on the United States, and in Jun 1942 unsuccessfully urged his brother Emperor Showa to negotiate for peace. In 1942, he was promoted to the rank of captain and served at the Naval General Headquarters in Tokyo. In Jul 1944, Prince Nobuhito was among those who conspired against Prime Minister Hideki Tojo. After the war, he became known for his philanthropic efforts. He also became the honorary president of various charitable and cultural organizations, such as the Japan Fine Arts Society, the Saise Welfare Society, and the Tofu Society for the Welfare of Leprosy Patients. Prince Nobuhito died of lung cancer on 3 Feb 1987 at The Red Cross Medical Center in Tokyo. He now rests in peace at the Toshimagaoka Cemetery in Tokyo. 3 Jan 1905 Nobuhito was born. 3 Feb 1987 Nobuhito passed away.